This post will guide you how to use Excel AVERAGEIFS function with syntax and examples in Microsoft excel. 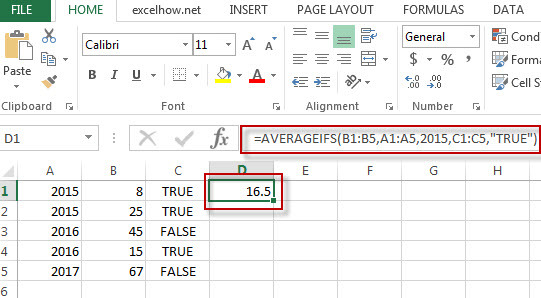 The Excel AVERAGEAIFS function returns the average of all numbers in a range of cells that meet multiple criteria. The AVERAGEIFS function is a build-in function in Microsoft Excel and it is categorized as a Statistical Function. The AVERAGEIFS function is available in Excel 2016, Excel 2013, Excel 2010, Excel 2007, Excel 2003, Excel XP, Excel 2000, Excel 2011 for Mac. Average_range – This is a required argument. The range of cells that you want to average. Criteria_range1 – This is a required argument. The range to apply the associated criteria. Criteria – This is an optional argument. The criteria used to define which cells are averaged. The below examples will show you how to use Excel AVERAGEIFS Function to return the average of all numbers in a range of cells based on multiple criteria.